Father’s Day provides a wonderful opportunity to celebrate this unique and important relationship in the lives of children. Whether they’re dancing with their babies, walking in the park, or teaching their children to be self-sufficient, the fathers in these books know a thing or two about being a great dad. Enjoy! Little Flora has a dilemma. Her first-grade class assignment is to write a Father’s Day Card for her father. But how can she write about an incarcerated father she’s never known? A touching and much needed book about a tough subject not typically written about in children’s literature. On Saturdays, Granddaddy and Janna always head for her favorite place in the world — Terrell’s barbershop. There, Granddaddy and his friends are kings in barber chair thrones, and Janna is a princess, showered with love and attention. When Janna’s Granddaddy passes away, she feels she has lost their wonderful kingdom forever. But with great courage and some unexpected help, Janna finds her way back to the happiness of those special Saturdays. This book evokes excitement, pride and perfectly shows the love a boy can experience with his father through work and play. With themes of: overcoming fear, courage, family, water safety, positive affirmations, encouragement, patience and determination I think Jabari Jumps is a great book to read around Father’s Day or anytime of the year. Read my full review here. 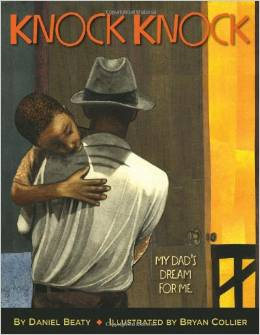 Though Dad moves around a lot and his jobs keep changing, a young girl and her brother hold fast to memories of his magical, unexpected visits in this portrait of an African-American family held together by a special bond of love. Leo and Daddy go to swim class where they kick, bounce, and dive like little fish. Joining other babies and their caretakers in the pool is a guarantee for unforgettable fun. Read my full review here. This wonderful read-aloud book brings to life a summer experience of spending the day at the beach. A gentle father-son bond is shown in both text and art, reassuring young readers even as they share in little Greg’s moment of worry at finding himself lost and alone. My son recently got his first haircut and he loves going to the barbershop with daddy. In this book, a young boy, Miles, makes his first trip to the barbershop with his father. Like most little boys, he is afraid of the sharp scissors, the buzzing razor, and the prospect of picking a new hairstyle. But with the support of his dad, the barber, and the other men in the barbershop, Miles bravely sits through his first haircut. This book captures an important rite of passage for boys and celebrates African-American identity. In this collection of poems by Nikki Grimes, a child learns about prayer from his father, whose prayers carry the family through each day — no matter what the circumstances. Nikki Grimes believes that spirituality and prayer are signs of true strength and power. When Daddy Prays celebrates fathers who help their children see this. I love the relationship this father and daughter share during the historic moment of the Million Man March that took place back in October 1995. I also love that this book celebrates an important gathering of men who all came together in peace for one common goal. No violence, no egos, no competition. Just men who were committed to inspiring and empowering themselves and each other to make positive changes in their families and communities. This story consists of four short verses about the happy home life of a young African-American boy. Family love and the shared stories and symbols that connect the generations are pervasive themes. This is a book of poetry that testifies to the powerful bond between father and child, recognizing family as our greatest gift, and identifying fathers as being among our most influential heroes. Will Smith— musician, actor, and father–brings us a moving celebration of fatherhood. 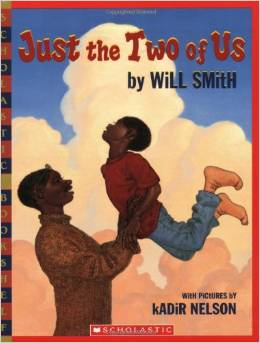 Smith’s heartfelt lyrics and Kadir Nelson’s vibrant paintings capture the beauty and intensity of a father’s love as his child grows from a boy into a man. This poignant portrait will resonate with fathers and sons everywhere. I think this book is such a cute testament to the relationship between fathers and daughters which captures the importance of fatherhood perfectly. Not everyone is blessed with parents or dads who are active. Let’s face it, for many dads, doing hair isn’t as easy as most moms make it look. From basic pony tails to buns to complex braids, there’s a lot to learn. Read my full review here. Life isn’t always sunshine and roses. All some incarcerated dads want for Father’s Day is for their children to come and visit them in prison. A great book to read if a child doesn’t have a father present in the home or is being raised by a single mother. This book sends the message loud and clear that love is what makes a family. Little Cheryl learns this from her sage grandmother and her mother. Once Cheryl understands this, she is finally ready to complete the Father’s Day essay she has to write for school. Although Cheryl’s dad left and is no longer present in her life, she isn’t sad by the end of the book. A heartwarming and touching story about a boy who imagines how his absent father would be if he were in his life. Another great book for children with absent fathers in the home or for kids being raised by single mothers. This touching story from bestselling author Doloris Jordan celebrates the blessings new parents wish for their babies all through their lives. I absolutely adore this story about a young girl and her uncle attending a Native American powwow! Bonus points for it being an #ownvoices story which makes it so authentic. And I love the way the uncle tells stories! A fun read for giving children an introduction to what a powwow is all about. An adorable story about a hardworking father who works third shift. Every night him and his daughter play, eat dessert and read together for storytime before he tucks her into bed. This follow-up to the best-selling Mama, Do You Love Me? captures the universal love between a father and child. Set in Africa and featuring the Maasai culture, the beautiful watercolor illustrations, lyrical text, and enduring message are sure to make this another instant classic. Mei Mei s grandpa is practicing tai chi in the garden, and Mei Mei is eager to join in. As Gong Gong tries to teach her the slow, graceful movements, Mei Mei enthusiastically does them with her own flair. In Papá and Me, a young boy and his papa may speak both Spanish and English, but the most important language they speak is the language of love. Written as a letter from a father to his daughter, Yo Soy Muslim is a celebration of social harmony and multicultural identical. The beautifully written verse highlights the diversity of the Muslim community. There are themes of acceptance, cultural identity and faith. Do you have a child who wants to get a pet? Would they settle for having a pet dad instead? In this book, a little girl named Plum is in search of the perfect pet. In the end, she realizes she has the perfect dad which is way better than having a pet. Dad by My Side is a heartwarming story of a father and his daughter and the wonderful bond they share. The father is depicted as a protective, gentle giant who understands the emotional needs of his daughter. Readers will see the father sewing, plaiting his daughter’s hair, cooking and playing. I think adults will appreciate the very positive father daughter relationship shown in this book, while making it relatable to children. This book shows the positive side of having a tattoo. It’s told from the perspective of the father of a young boy who asks his dad after dinner to tell him the story of his tattoos. Each story serves as a great reminder of the things that matter most to his dad. Daddy stays home with their toddler while Mommy works. They do everything together: they do the laundry, dance, and race to the park. Everything is fun with Daddy! At bedtime Daddy reads to the toddler making every day a good day! This book serves as a great reminder to children that a parent or loved one will always come back and pick them up after drop off. A heartwarming and charming story of bravery, courage, facing fears and father-son bonding. An endearing celebration of dads who are young at heart. This playful book follows four father-child pairs as they spend happy, silly times together, popping bubble wrap and watching cartoons and taking part in shopping cart races. These are dads who aren’t worried about looking goofy or getting their hair wet – dads who still remember what it’s like to be little. Don’t be fooled. They may look like grown-ups on the outside, But underneath they’re just like you . . . Kids! Your baby’s first word will be . . .”Dada!” Right? Everyone knows that fathers wage a secret campaign to ensure that their babies’ first word is “Dada!” But how does it work? NBC’s The Tonight Show host, Jimmy Fallon, shows you how. 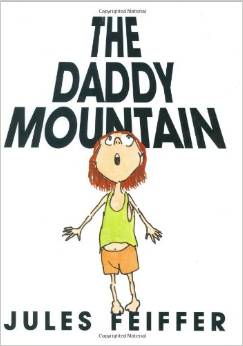 A really cute book about a girl and her dad. For Mimi, the best day of the week is always Saturday, because she gets to spend it with just her Dad. Before your very eyes, this little redhead is about to do something extremely daring. And scary. And she’ll show you-she’ll actually document, step-by-step-exactly how she does it. First, she takes her Daddy and makes him stand very still. Then, balancing herself on his shoe, she wraps her arms tightly around a leg and starts her perilous ascent to the summit. From the author of the popular Llama, Llama series comes a delightful story starring a loving daughter and daddy duo! Nelly Gnu loves painting, building, and drawing — but everything is better with Daddy Gnu! Over the course of a special day, Nelly and her daddy plan an exciting project to build together. Daddy listens carefully to Nelly’s ideas, but Nelly also learns to listen to Daddy’s thoughts, too. Filled with fun rhyming text, this charming story is sure to delight your little ones. Vivid illustrations perfectly capture the special day of a loving and attentive father and his doting daughter. Because I Am Your Daddy is a great read-aloud book at story time or a soothing book at bedtime. How many daddy hugs does it take to say I love you? Cuddle and count with this hug and read book with darling illustrations. I gave this book to my husband for Father’s Day last year and included a special note from the kids. It’s time for bed, but Baby Bear just wants to play. When Daddy asks for a goodnight kiss, this grumbly baby says no way. This charming father coaxes his son through his nightly routine by asking Baby Bear for giraffe kisses, crocodile kisses, bat kisses, and more! Bright, energetic illustrations convey Baby Bear’s change of heart as the charming relationship between father and son plays out before reader’s eyes. Powell delivers an exuberant, lively board book celebrating dadNtold from a child’s point of view. Little Bear’s dad is simply the best! He wakes up his cub with a tickle on the nose and a kiss. Then the two spend a wonderful day together—exploring, splashing through rain, and swimming in the river. At the end of the day, they snuggle together under the stars. A cuddly little bear has a tale to tell about his dad, “the roughest, toughest, biggest, strongest dad in the whole jungle.” The real fun is in the illustrations of cute cubs marching behind and listening— and running off one by one in fear as they hear that Daddy has teeth sharper than an alligator, more claws than an eagle, and can roar as loud as a lion. But when the little bear finds himself alone and gets scared, it’s Papa who comes to save the day. It’s the night before Father’s Day, and Mom and the kids have a plan to surprise Dad with a special gift. When Dad goes for a bike ride, everyone gets to work. Dad wakes up the next day to find his garage newly organized and his car sparkly clean. So, of course, he celebrates by taking everyone for a spin! I love the rhymes in this book that are similar to “The Night Before Christmas”. A cute, silly and simple story about a boy and his dad. It’s fun and entertaining to read aloud with your little ones. 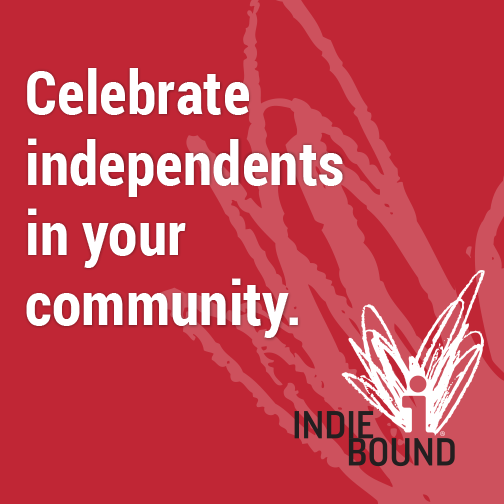 Your turn: Did you enjoy my book suggestions? 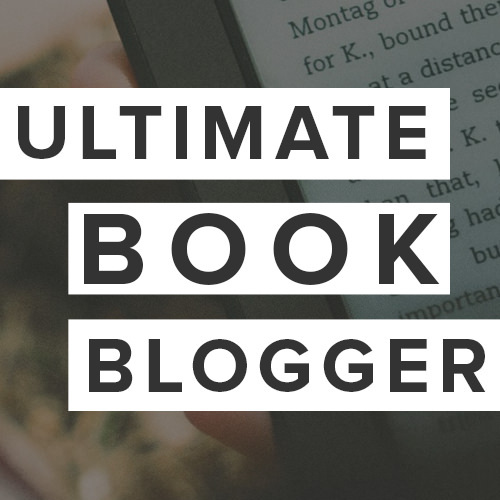 What books would you add to this list? Feel free to let me know in the comments! Great selections! Makes me want a toddler again!